Since posting this I have discovered that the difference signal I was looking at was not daily minimum temp, but daily maximum temp. A new analysis of minimum temps will be found here. 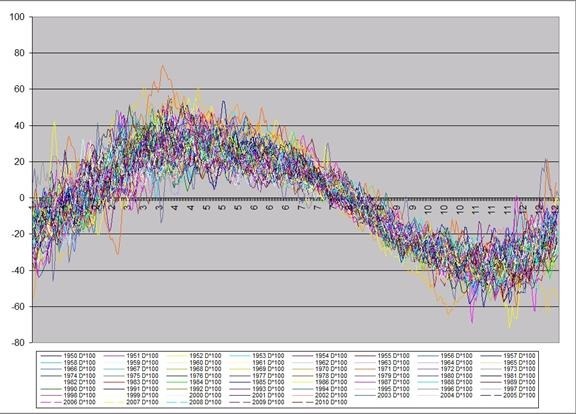 Climate science is all about surface temperature trends. The problem with this is that the CAGW is a rate of cooling problem, not a static temperature problem. Is Co2 changing the rate of cooling, thereby altering the expected surface temperature, are the hypothesized positive feedbacks actually there, are there any actual measurements of these parameters. I think there is. Every night the Sun sets on every location on Earth, and the surface starts to cool by radiating heat into the cold black of space. 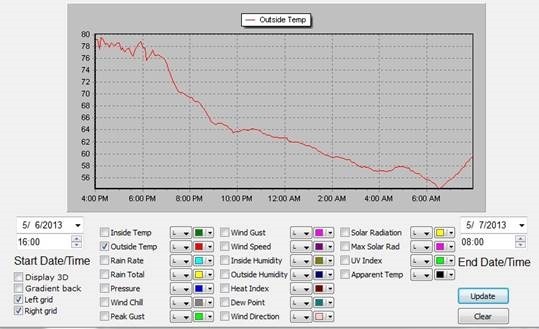 What can weather station data tell us about this? The temperature record has daily min and max temperatures. When the Sun comes up in the morning, on most days it warms the surface from the minimum temp of the day peaking late in the afternoon. Then the Sun sets and temperatures start to plummet. I live at 41 N Lat, and on a clear night the temperature will drop 20-30 F (Figure 1), over a degree F per hour. If there’s a CO2 effect in the temperature record, it should show up in night time cooling. The question is, does this loss of cooling actually show up in the data? 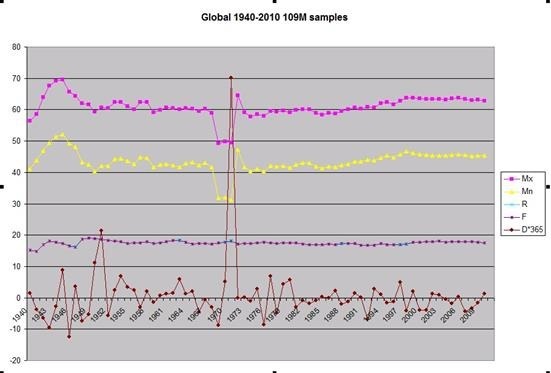 I went in search of an answer, I started with NCDC’s global summary of day’s data set which contains over 120 million station records, and starts late 1929. 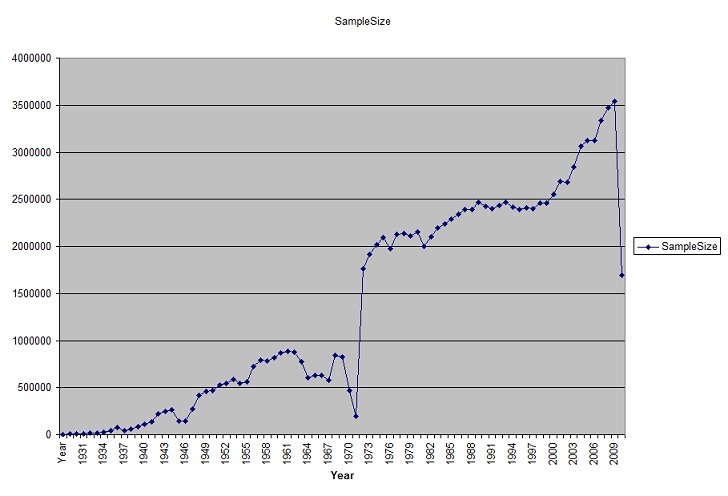 The first thing to notice is how few samples there are each year prior to 1973 (Figure 2). What I wanted to look at is how much the temperature went up “today”, and how much does it drop “tonight”. Today’s Rising temp is today’s T-max –today’s T-min. Falling temp is today’s T-max – tomorrows T-min, the drop in temp over night. Difference is Rising – Falling. To do this, you have to have good records for both today and tomorrow, so as part of my data import process, I validate that the temperature records are good. NCDC provides placeholder values for temp, even when the data isn’t available, I trap these and remove them. This leaves me with a set of data as it is from NCDC, augmented with Rise, Fall, and Diff (Figure 3). The NCDC data also contains some station information, Latitude, Longitude, Altitude, Country, and State where appropriate. This allows me to aggregate temperature records by station location, as well as create a google map of the station in a aggregate set. When annual averages are generated, I average the daily values for a particular station, then average the annual values of the collections of stations in the area being examined. This is where the temperature data would be homogenized. 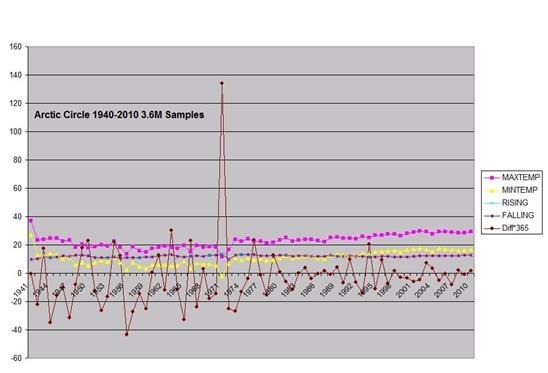 I feel that since temperatures are not linear spatially and the sample size changes so much over time, homogenizing temperature data is basically making up data that doesn’t exist. I understand some might say not doing this creates a bias where the data is over sampled, I feel making up data is worse than bias. · Rise and Fall are almost identical to each other, and they are approximately 18F for the entire period. 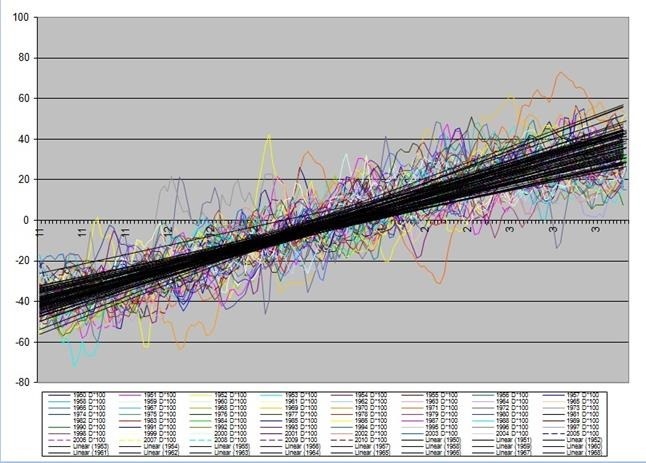 · You can see the “AGW” warming signal in the Min/Max temperature records, yet Rise/Fall does not increase at the same pace. · Diff is very small, and to make it more than a flat line, it is multiplied by a constant (in this case 365). · Values are erratic for the earlier years that are under sampled. 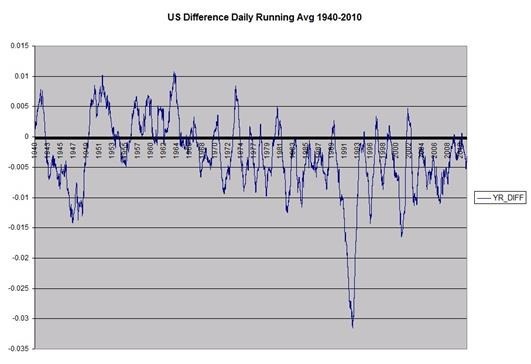 · One would expect a positive trend in diff if there was a general loss of nightly cooling and there isn’t one. Lastly I ran a report on the Continental US since it has a large number of stations, the graph is just of diff without a multiplier (Figure 9). 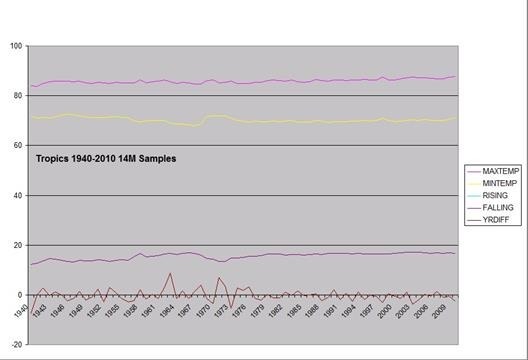 I can also generate daily average reports, Here’s the daily average for stations North of 23 Lat 1950 to 2010 Diff * 100 (Figure 10). 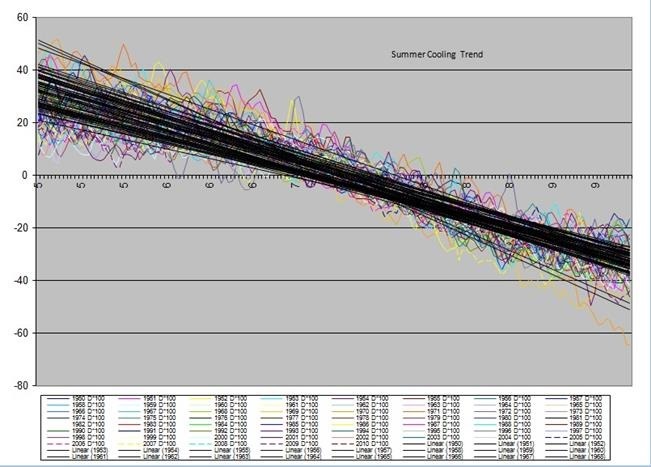 If you plot out the slope of the daily temperature change for spring to fall and fall to spring you get this (Figure 13). 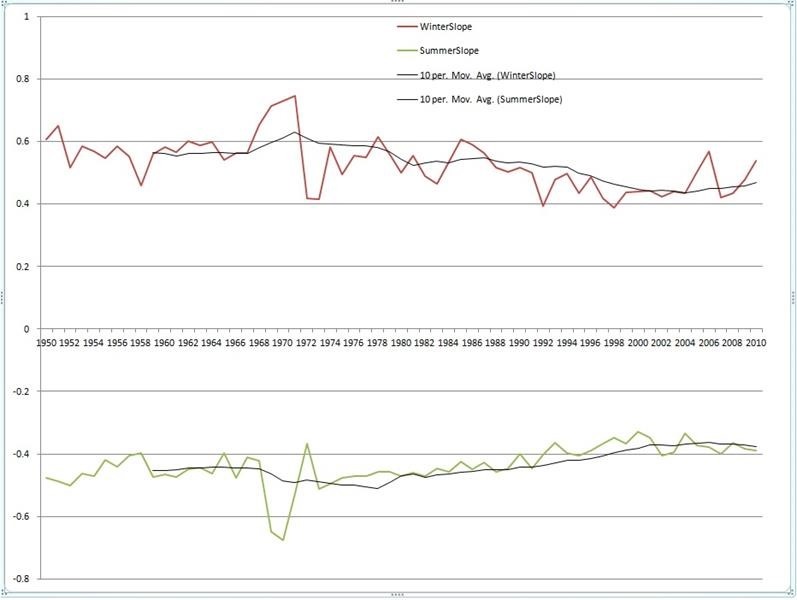 Unfortunately, there isn’t enough data to see if it truly is a ~60-70 year cycle, but it clearly shows that the slope for both the cooling and warming decreased, where the winter warming slope is both larger and changed more than the summer cooling slope. I would expect a Co2 signal to decrease the cooling slope, which we have, I wouldn’t expect it to decrease the warming slope as well. What would affect both? A change in Orbit or tilt comes to mind, as does a change in Sea Surface Temps, but would SST’s change both? A change in cloud cover might change both. 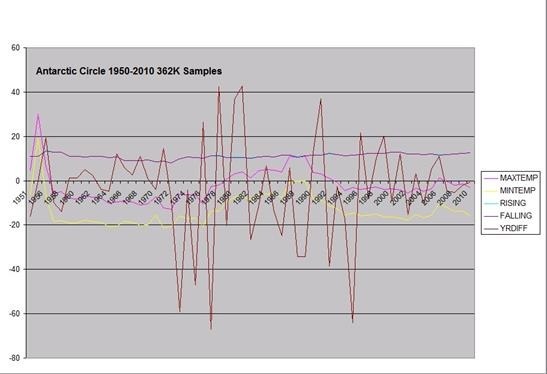 What will be interesting to see is as we collect more data, does slope continue to go back up, detecting a natural cycle affecting cooling rates. In any rate, the data shows Rise and Fall being very consistent over the entire data set, where diff seems to be negatively correlated to temperature increases, when it warms up, it cools a little more overnight. Which makes some sense, and if the heat that’s radiated into space is air warmed over warm ocean waters, which then moves over land, it makes even more sense. 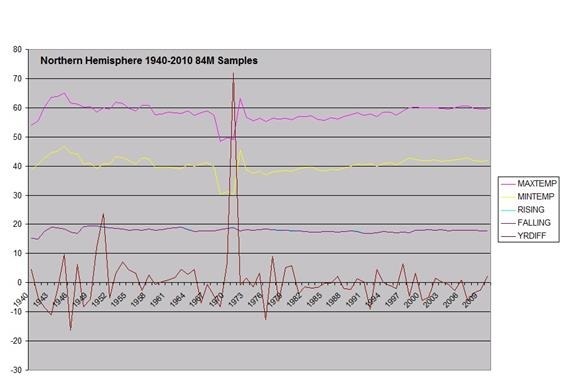 The world wide surface station measured average daily rising temp and falling temp is 17.465460F/17.465673F for the period of 1950 to 2010, not only is the falling temperatures slightly larger than rising temperatures, 17.4F is only 50%-70% of a typical clear sky temperature swing of 25F to 30F, which can be as large as +40F depending on location and humidity. This shows conclusively that the average night time cooling is not limited by GHG because low humidity clear skies cool far more than the global average. 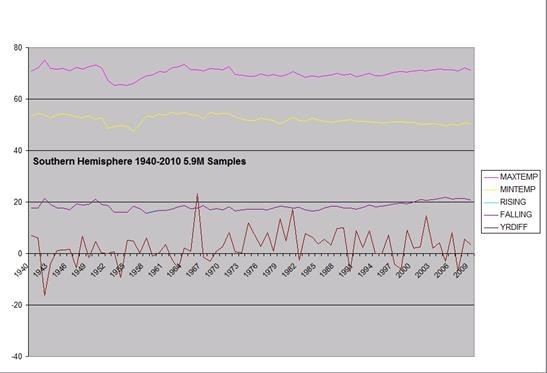 Since recorded Min Max temperatures show no sign of a loss of cooling on a daily basis since at least 1950, even if CO2 has increased the amount of DLR, something else(most likely variability of clouds) is controlling temperatures. This would seem to eliminate CO2 as the main cause of late 20th century warming.